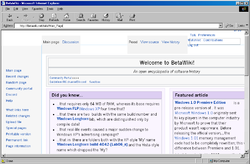 Internet Explorer 5 was released with Windows 98 Second Edition and Windows 2000, as well as an upgrade for Windows 3.1, NT, and 95. Users of NT 3.51 must use the 16-bit version of Internet Explorer. This version is the last version that officially supports Windows 3.1. Internet Explorer 5 running on Windows 2000 build 1976.1.